The LOGIK LHDAB14 is compact and has decent battery life but the DAB reception is relatively poor. The LOGIK LHDAB14 is very small and light, so it’s easy to carry around in your pocket. One issue with the design is that it’s easy to turn the radio on by mistake as the power switch is on the side. The battery life is relatively good for a pocket DAB radio. 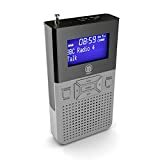 It should last for up to 12 hours, which is better than the 6 or 8 hours offered by some other pocket radios. You recharge the battery by plugging the radio into a computer using a mini USB cable. The DAB reception is relatively poor compared to many other radios, and it also loses the signal easily if you listen while moving around or travelling. Sometimes you can improve the reception by adjusting the position of the headphone jack. Another issue is that the display is quite dim which makes it hard to read when it’s bright and sunny. The LOGIK LHDAB14 is nice and small and has decent battery life, though it does have some serious flaws. 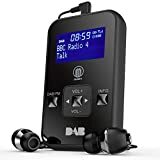 The biggest issue with this radio is that the DAB reception is relatively poor, which can make it frustrating to use unless you live in an area with a very strong signal. 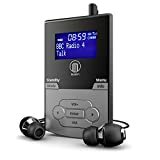 One of the best pocket DAB radios is the VQ Blighty, which has a stylish design and offers better reception than the LOGIK LHDAB14. A good budget alternative is the Majority Petersfield DAB radio, which offers solid performance without being too expensive. 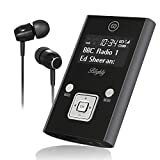 For some more recommended pocket DAB radios, see this article: Best Pocket DAB Radios.